I was asked recently to try out a sample of Capriclear Soothing Oil. The only ingredient in this spray-on moisturizer is fractionated coconut oil. I’ve learned so many good things about coconut oil in recent years that I loved the idea of trying it as a spray. Awhile back I tried out another spray-on moisturizer, and loved the convenience of the spray bottle, but found that it didn’t last long on my Ethiopian daughters’ very dry skin. In addition, one of my daughters is very sensitive to fragrances, and because of this she has almost given up on moisturizers. This spray goes on very light and after being rubbed in, it absorbs nicely and lasts well. 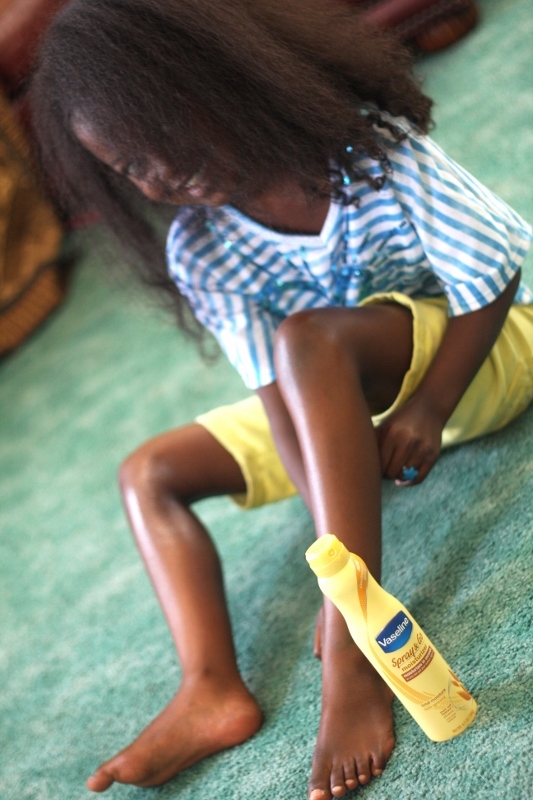 Several times I even used it in my girls’ hair, to add some shine and extra moisturizing. I liked the way it worked for that purpose too. The spray was billed as perfect for babies, due to it being only one ingredient and fragrance free. 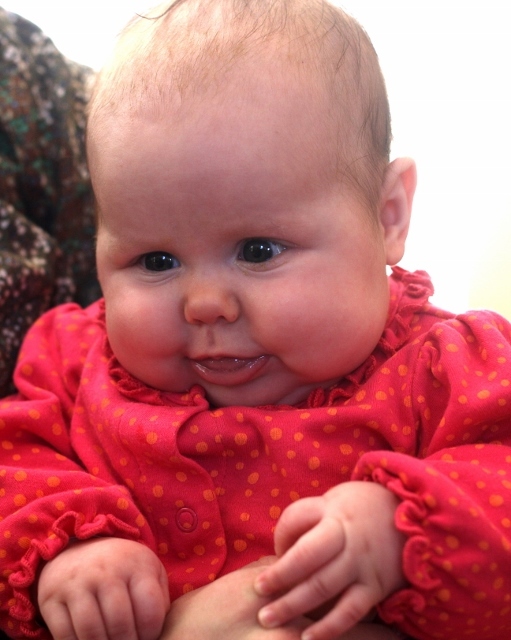 So after trying it at our house for a few days, I handed it off to my daughter to try with her baby, whose skin was a little broken out at the time. Amanda reported that it worked well for little Wilona and seemed very soothing. I will be giving away a bottle of Capri Clear to one reader early next week. If you are interested in entering the drawing, comment below and tell me something interesting that is happening at your house this month. As for us, we are chugging along with school, trying not to get too tired of it all. We have an ambitious schedule this year and I’m hoping we can keep up so we can have a long Christmas break like we usually do. The biggest two things on the list are high school Chemistry (Apologia) which I am hoping to complete in ONE year, AND an essay a month for everyone. Writing and editing can take lots of time, and Chem is very time consuming as well. So far, the most exciting thing this month that has happened is that our 18 year old daughter Lidya was invited by her friend Henry to go to the homecoming dance at his school. We had great fun shopping for her dress (yet another score for thrift shopping!) and also adding a bit of bling to the dress. She and Henry had a very nice evening, first going to Outback for dinner with some friends (where an anonymous stranger paid for ALL their dinners) and then off to the dance. Such fun! Writing is going well. I’ve got 7 out of 10 chapters pretty much pulled together. However, I keep thinking of more and more I need to write about! Hopefully I will have it all pulled together within the next month or so. I’d love to get it turned in early, but we’ll see. I’m starting to keep my eyes open for fun Christmas ideas for my clan– with so many people to shop for, I always need to start thinking early. These days the grandbabies are the easiest to shop for, and the teens are more challenging. Little baby Ali is getting bigger. Isn’t she sweet? Looking forward to hearing what’s going on in your world! This week we had craft day at our church– a homeschooling coop with a bunch of friends.There are usually 20-25 kids — some teens, a few toddlers and preschoolers, but most of the kids are probably in the 5-12 age range. Moms each take turns being in charge of the craft, and we don’t really expect anything huge or involved. But when it’s your turn, you always want to do something that is enjoyable for all, which can be tricky with that broad an age span. I was in charge this month, and decided to go with an art project that I’d seen online. This cartooning video is part of a whole series of DVD art classes designed for homeschooling families. I watched it ahead of time, and decided to show about 25 minutes of the 70 minute video. This was the first time our group had done anything quite like that, but it ended up working really well. The teacher steps kids through the art in a really doable way. For example, she began by showing kids how to make different kinds of cartoon eyes, noses, and mouths in a collection on a sheet of scrap paper. It was all very simple and non-intimidating for folks not sure of their drawing ability, but varied enough to also intrigue the kids who did like to draw. Then she showed how to cartoonize shapes of vegetable using a mix of the features that she’d already shown the kids how to draw. Not every kid adored the activity, but at any given moment during the 25 minute drawing session, a good 75% of the kids were happily engaged, which in a group that diverse I consider a big success. The preschoolers ended up being happy mostly coloring and drawing free-form, but several of the 5 year old kiddos were able to follow along and do some interesting faces with the instruction of the DVD. I’m looking forward to showing the rest of the video to my kids at home. Now, the fun part: I am giving away a cartooning DVD to one of you! All you have to do is comment below and tell me a bit about your family and art. Do you enjoy drawing or does it intimidate you? What about your kids? Who do you think would enjoy this video most at your house? For a second entry, you may share this giveaway on Facebook or Twitter, or you may ‘like’ See The Light on Facebook. I will choose a winner early next week. Want a pair of Monster headphones? This post is brought to you by Monster Headphones and BlogHer. Recently I was sent a set of Monster N-Tune Headphones to review here. Mine came in a really pretty shade of blue. So shiny and sleek– I wanted to pet them. I tend to use earbuds. I find headphones to be bulky and I don’t like not being able to hear a thing going on around me. Must not dull my Spidey momma-senses, ya know! You never know what will happen while you’re oblivious. But when I tried these lovelies on, my mouth hung open. Ohmygoodness. The beauty of the sound that comes out of these things. It’s no wonder I have been seeing headphones on people all over the place these days. I tried them out for about an hour yesterday, while sitting in my bedroom working on a writing project, and I felt utterly enveloped in my own beautiful world. These things just wrap you in utterly luscious sound– I wanted to keep them on forever. The ear pieces sit on, not around your ears, which I found to be very comfortable, and the curved piece that connects the two earpieces is adjustable for a variety of head sizes. I was planning to give them to my husband for his birthday in November, but I ended up giving them to him WEEKS early because I was so excited about them. And let me tell you, I loved them so much that it was more than tempting to keep them myself. Maybe he’ll share with me now and then! I’ve got to say up front, the price point is painful. $150 is outrageous, in my book. But oh, the sound. Even cheapskate me was sorely tempted to spring for a set. If you’ve got a music lover on your Christmas list, and your budget is fairly generous, this might be something to consider– it would definitely be something that any music lover would enjoy. These things are durable and beautiful, and feel like they’re extremely high quality. Now the really fun news: There’s going to be a giveaway of 25 sets of Monster headphones, valued at $150 each. All you have to do for a chance to win is to click over to the Monster Headphones page on Walmart.com and let us know in my comments which is your favorite NTunes color. All comments left on all participating blog posts will be combined and 25 pairs of headphones will be awarded from those comments. Winners will be chosen November 1st. So comment away, and good luck! I was given a pair of these headphones and compensated in exchange for this review. The opinions stated are my own. Today I’m giving away a copy of a lovely book that came to me for review recently. It is called The Knitted Slipper Book: Slippers and House Shoes for the Entire Family . This collection of 30 designs contains styles for everyone in the family. In addition to knitting instructions, the book teaches you how to do felting, shaping, sizing, attaching soles, linings, and insoles. Some of my favorite designs include tiny-baby Mary Jane style shoes with soft leather soles, and Indian-style moccasins complete with beading. 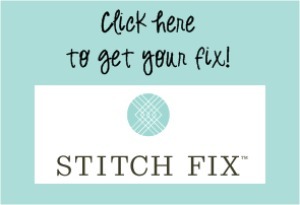 The author of this book is Katie Startzman and she writes a knitting blog called Duo Fiberworks. If you would like to win a copy of this book, comment below and tell me about the favorite knitting project you ever did. For me, it would have to be a soft mint-green baby sweater I knitted for my second-youngest daughter when I was waiting for her to come home. She and my youngest both ended up wearing it, first as babies, and then into their preschool years as an elbow-length shrug. I loved it and it held up beautifully. I’ll choose a book winner next week. And if you’d like just a little peek inside this book, watch this cute little video. If you have little children, they’ll enjoy watching it too. Here’s a fun book to keep in mind if you have a Lego fanatic on your birthday or Christmas list. It’s called Cool Creations in 35 Pieces and features many uber-creative ways to use the same 35 lego pieces to construct some very cool looking little critters. This book would be a great gift all on its own, but would be even better paired up with some new Legos. The book mentions an age range of 4-8 years, but the creations in this book are enough fun that I could easily picture a 12 year old enjoying it. Now the great news: I have one copy of this book to give away! All you have to do to enter the giveaway is comment below and tell me one sure winner of a toy that your kids have enjoyed for years. At our house the answer is Legos and Barbies, no contest. What do your kids enjoy most? If you’d like an additional entry to win, share/like this post on facebook or twitter, using the buttons below, and comment again, telling me you did so. I’ll choose the winner of the book on Monday. Way back in the 90’s when our now-grown girls were tiny, one of the movies that found its way to our VHS player fairly often was Disney’s Little Mermaid. As a family who loves to quote movie lines, we still joke now and then about dinglehoppers, and I think we all ended up memorizing at least part of the song, ‘Kiss the Girl’. We still own that same well-worn VHS copy of Little Mermaid. Only problem is, all but one of our VHS players have bitten the dust, and the one that survived happens to be one of those all-in-one TV/VCR combos. So when our little girls get a hankering to watch Little Mermaid or another movie in our VHS Disney collection, one of their brothers has to tote out the TV/VCR, and attach it to our regular TV before they can let their movies play. Yes, it works, but it’s a little clunky, and every time we pull out that TV, I wonder how much longer that VHS player will last. That’s why I was pleased when I was offered a ‘Diamond Edition’ copy of Little Mermaid to review. The girls had fun popping it in and watching a favorite again. When ‘Part of Your World’ came on, I might have broken into song, just for a moment or two. And my 15yo sons might also have looked at me cross-eyed. They ought to be used to me breaking out in song by now — singing has always been a love of mine, something that really brings me joy. As for my little girls, they joined right in and sang along. They’re still at that gloriously unselfconscious age where they don’t spend a second worrying what other people will think about them. I hope that even when they move into the teen years, they’ll keep doing what brings them joy– yes, even if they get a cross-eyed look now and then. For one of my daughters, that joyful thing is definitely art. And both of them love to sing. What activities bring your child joy? In conjunction with this review, I am giving away a $50 Visa Gift Card and a Little Mermaid Diamond Edition Blu-ray Combo Pack. All you have to do to enter the drawing is comment below and answer this question: How do you encourage your children to follow their dreams and do what brings them joy? This sweepstakes runs from 9/9/13 – 10/15/13. We’ve all been around kids who haven’t learned respect yet, and probably all resolved at one point or another that our kids would learn to be polite and respectful when out in the world. But how to get there? Recently I was asked to review the book Raising Respectful Children in a Disrespectful World. It’s all about parenting in a way that focuses on character training above everything else. The book emphasizes the importance of connecting with a child’s heart to better influence their decision-making and shares ideas for character training at every age. As an experienced momma, I didn’t learn huge amounts of new information, but there were lots of good reminders. The book was a great encouragement to stay the course, keep working on heart-connection, and unapologetically, repetitively, and gently call on my kids to interact respectfully with the folks in the world around them. Now– good news: I’ve got a copy of this book to give away today. All you have to do to enter the giveaway is share one facet of of good manners that makes an impression on you. I personally appreciate it when my kids’ friends make eye contact and are willing to have a few sentences on conversation with me. What about you? When you interact with a child or a teen, what leaves you saying, ‘Wow, that kid had good manners?’ I’ll choose a winner on Monday! I was given a copy of this book in exchange for a review. The opinions stated are my own. – Vaseline® Spray & Go Moisturizer Cocoa Radiant™–contains pure cocoa butter to help your skin glow. The lotion dispenses in a spray bottle that works at whichever angle you hold the bottle. It absorbs into your skin in 10 seconds, and the spray makes it extremely easy to get full body coverage. I’ve tried this on myself and on my two youngest daughters. I love how quick it is to get an even layer of lotion on the girls’ arms and legs. Spray, spin, spray again, and then all that’s left is for them to give the lotion a quick rub-in and they’re done! With other lotion, it was common to miss spots, leaving part of their skin still greyish and dry- looking. But with this lotion, even if the girls don’t rub everywhere, I’ve already gotten lotion everywhere, so there aren’t any dry patches. The lotion has a light pleasant scent—not overwhelming at all—and seems to work very well both on their skin and on mine. You can see how it makes my daughter’s skin glow. It makes lotion-time fun and easy! If you’d like to know more about Vaseline® Spray & Go Moisturizer, go to their Facebook page. How would Vaseline® Spray & Go Moisturizer Total Moisture® max your morning? Answer that question in the comments below, and you will be entered in a drawing to win a $1,000 SpaFinder gift card. This giveaway is open to US Residents age 18 or older. Winner will be selected via random draw, and will be notified by e-mail. You have 72 hours to get back to me; otherwise a new winner will be selected. This sweepstakes runs from 7/1/13 – 7/31/13. Be sure to visit the Vaseline® Spray & Go page on BlogHer.com where you can read other bloggers’ reviews and find more chances to win! I’ve loved the look of Mikarose dresses for awhile– they are modest and stylish, which is a hard combination to find sometimes. Recently Mikarose graciously gave my two expectant daughters a chance to try out a couple of the styles that are good for maternity. 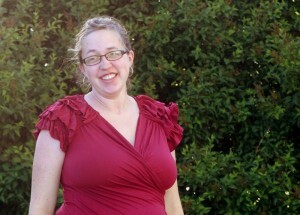 Amanda is due in July, and Erika is due in September. More pictures are on the girls’ blogs, so be sure to click on over to see. Big thanks to Mikarose for helping my lovely girls answer their maternity wardrobe questions. And just a heads-up, Costco is featuring Mikarose dresses in some of their stores this summer, so check it out! 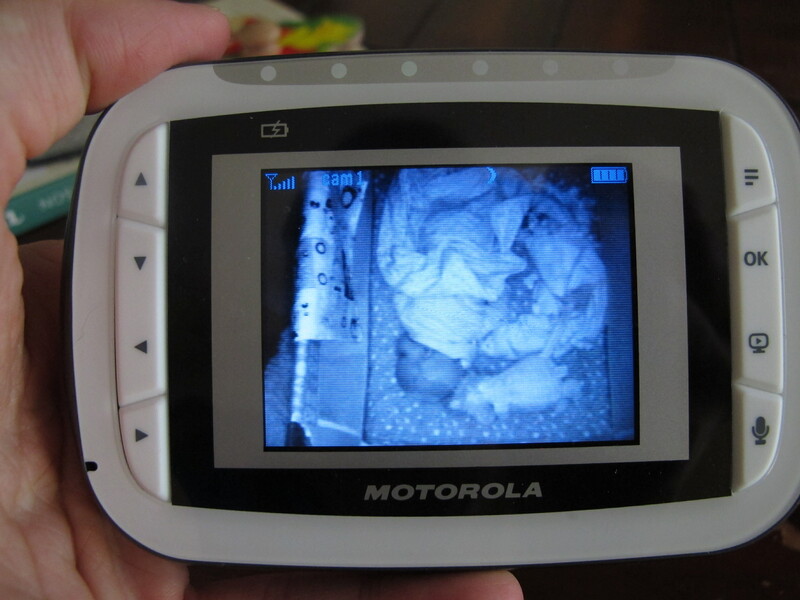 A couple weekends ago my mom gave me a Motorola Wireless Video Baby Monitor that the company had sent her to review. I was excited to set it up and see what we could see. The video monitor is fun to have, though of course not really necessary. 🙂 Most nights I still find myself relying mainly on the old monitors just because I already have them figured out, set up where I need them, and am in the habit of using them. Has really nice night vision and video feed shows up well on the parent screen. The camera piece’s LED light isn’t ridiculously bright. The parent end is completely portable with a built in rechargeable battery. The audio is clear and as loud as necessary. Not too big so pretty easy to carry around. The parent end is just about twice as thick as an iPhone. I was able to fit it into a skirt pocket easily though I was worried about pushing buttons. Seems to be durable: I’ve already dropped each unit at least once. Though I wouldn’t suggest doing it on purpose! When the battery on the parent device is running low it beeps every few seconds until you plug it in. It bothered my husband that the two units had different power supply cords and they were not interchangeable. The cords are marked though so once you have them spread out to their different rooms it becomes less of a problem. The battery on the parent device is not night-long. If you were to plug it in next to your bed it would be fine, but I was woken by it’s beeping insistence to be plugged in around 3AM. This gives it about a 5 hour battery life, I’d say. Though I didn’t time it specifically. 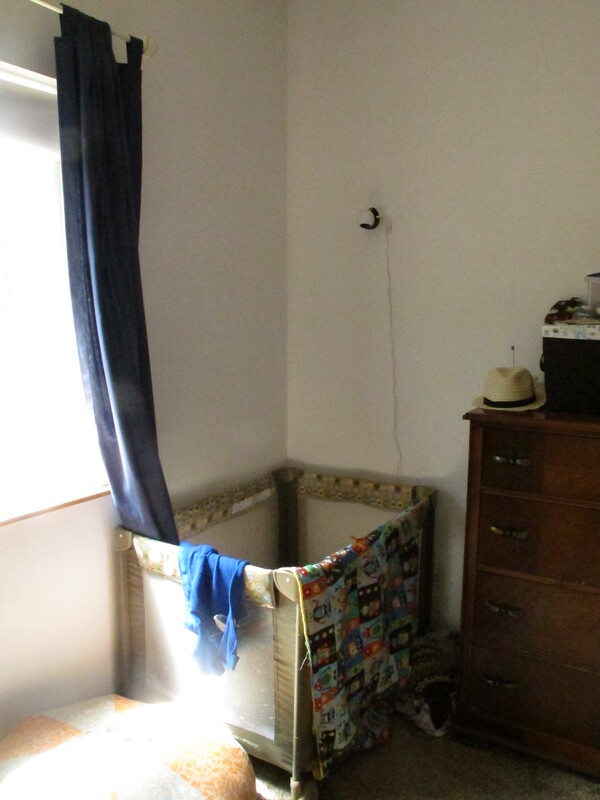 The video camera has to be hung on a wall almost directly over your baby’s bed though I guess it’s not a problem as long as you hang it well and divert the cord to where the baby can’t reach it. difficult to use at night though it is fairly simple to memorize their order. I’ve appreciated being able to see if Ranger is actually awake and in need of help settling or if he’s just moving a little and happens to cry out when he adjusts his position. I am guessing this will also be helpful when we switch Ranger out of his crib and into a bed. We’ll be able to make sure he’s actually in his bed and not falling off, playing, or generally causing mayhem. 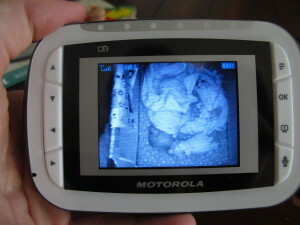 The video monitor would also be useful when first letting your baby sleep on their own. I remember when Ranger was a few months old, if he happened to sleep without me right next to him (before I went to bed or at nap-time), I would be constantly checking on him to make sure he was OK.
Having the visual confirmation that he’s OK keeps me from making unnecessary visits into his room and risking waking him up. All in all I like using it. It seems to be well made and I can’t complain about the design. Personally, it would be too expensive for me to justify buying, but I can easily see why someone (especially a first time parent!) might like to splurge on one for better baby surveillance.